The so-called two-color injection molding is an injection machine that uses two or more injection systems to inject different types and colors of plastic into the mold simultaneously or sequentially. There are two-color multi-mode clear injection molding, two-color single-mode clear injection molding, and two-color single-mode mixed color injection molding. A two-color injection molding machine differs from a conventional injection machine in that it requires a mechanism for rotating a mold (multi-mode-turntable) or a cavity (single-mode-rotation) in addition to two injection systems. Two-color mold injection principle: Two-color mold usually has two molds, half is mounted on the fixed mold fixing plate of the two-color mold injection molding machine, that is, the side with the injection gate, and the other half is mounted on the movable mold rotary plate, that is, the mold top Out of the side. The dynamic modes of the two pairs of molds are exactly the same in the general case, and the one-time fixed mode and the second fixed-mode are different. When the first material is injection molded, the fixed and moving molds are opened under the tension of the injection molding machine, and the first moving mold is rotated 180° with the product once. At this time, the moving mold does not eject, and then the mold is closed to carry out the second material. After injection molding, after cooling and cooling, the fixed and movable molds are opened, and the products on the movable mold side are ejected. Each molding cycle will have a mold once and a second product will be produced. Shrinkage is important for plastic mold design. It is the basis for mold design. It is related to the size of the product and the shrinkage of different materials. Only a suitable shrinkage rate will ensure that the product is cooled to the required size after injection molding. The shrinkage of the two-color mold depends mainly on the shrinkage of the primary material, and the secondary material should be selected to have the same shrinkage as the primary material. For example, the primary material is ABS (the shrinkage rate is usually 5 ‰), and the secondary material is TPR (the shrinkage rate is usually 18 ‰). When designing the two-color mold, the shrinkage rate should be set to 5 ‰, because the primary material is basically The contour shape of the product is formed, and the secondary material is wrapped on the primary product so that there is no greater or lesser shrinkage. Low Cost: We leverage an offshore manufacturing facility with a lower cost structure in order to offer lower pricing than our purely domestic competitors. High Quality: We are ISO 9001 certified, and our process quality systems ensure that your parts are the highest quality possible for your application. Quick Turnaround: We offer three different shipping methods,to accommodate your timing and budget requirements. Online Quotes: Our interactive online quotation system provides INSTANT quotes for plastic injection molding, CNC machining and urethane casting. In general, two-color molding is the first molding of the substrate and the second reshaping of the insert.Molding method: core rotation, unloading plate rotation, core retreat, cavity retreat and cavity sliding. Two-color injection molding usually uses the same plastic of different colors, so that the combination of the base and the insert is firm. If different types of plastics are used for injection molding, the bonding performance test must be carried out first. If necessary, grooves should be provided on the substrate to increase the bonding strength.Segmentation of secondary products：There are several factors that must be considered when performing a first or second product split. It is related to the success or failure of the entire mold design.The first thing to consider is the fluidity of the material (it has a great effect on the selection of the appropriate gate), and secondly, the appropriate product thickness is chosen. Since the secondary product is formed on the surface of the primary product, if the meat is not thick enough, It will cause poor liquidity and can easily lead to poor conditions such as lack of material and shrinkage. In general, the thickness of the secondary product is half or more of the thickness of the entire product. Gate location selection The two-color model is very particular about the choice of gate location. It is best to use mold flow analysis software for gate location analysis and fluidity testing to reduce the risk of mold fabrication failure. In addition, the shape of the product should be changed or the auxiliary glue position should be changed in an appropriate place to improve the direction and speed of the secondary material flow. When the secondary material adopts the side-feeding glue, the gate should be inclined upwards, and the gate width should be increased as much as possible to increase the fluid velocity, so that the fluid is rushed upward to the fixed mold during the feeding, so that the primary material can be avoided. Opening, causing light leakage in a product. Endometrial design The shape of the two fixed molds of the two-color mold is different, and each shape is formed. In general, the shape of the two moving molds is exactly the same. The product is preferred to use the latent glue, so that the product can be cut off automatically and the material is cut off. 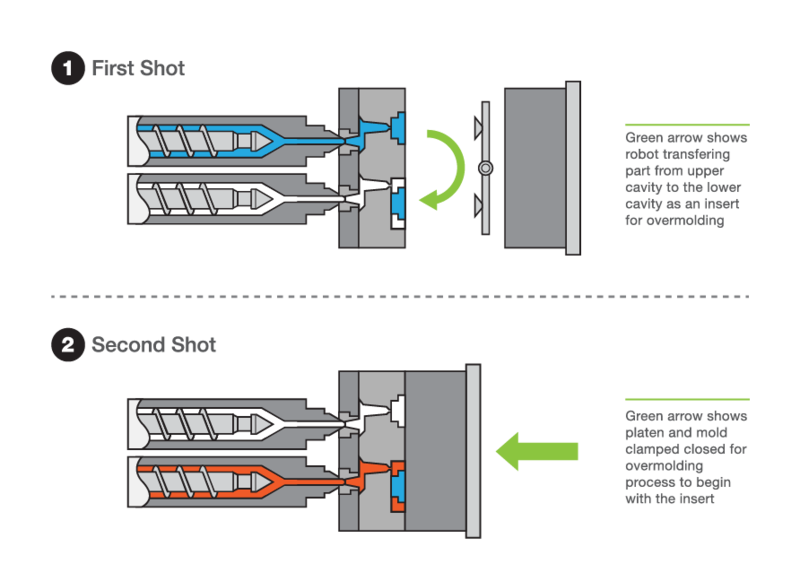 Sometimes the hot runner or the three-plate mold is not ejected after the first injection. At this time, some of the material will remain on the movable mold. Therefore, in designing the second injection molded fixed mold kernel, in order to avoid the fixed mold kernel being scratched by the primary material head, it is necessary to design the secondary fixed mold to avoid the empty part in the primary material part, so that the mold is in the secondary mold forming injection molding. The material head can smoothly enter the shelter position. Sometimes, in order to avoid the second fixed mold insertion (wiping) injury, the first time the formed product has been glued, one part can be designed to avoid the air, but each sealing position must be carefully considered (the outer wall of the product is away from the empty position). The distance must be at least 5 mm. Note that the fixed and movable molds are all inserted, and the slope of the broken surface is as large as possible, and the four corners are to be piped, so that it can be well matched when clamping. The design and secondary insertion of a fixed mold can be appropriately forced to empty in the case of ensuring strength. As shown in Figure 3: D takes 0. 2mm or more, this method is to protect the secondary moving mold from being scratched. Mold design The two fixed molds and the two dynamic molds of the mold need to be completely matched with each other. Therefore, when designing the mold core and the mold base, it is necessary to note that the processing of the mold core and the mold base must be taken by four sides; two fixed mold parts The total thickness is equal; the four guide columns are to be center-symmetrical (not to be eccentric with the reference angle guide column as in the case of a monochrome mold), and that the one-side clearance tolerance between the guide post and the guide sleeve is within 0.025 mm; Degrees, parallelism and flatness tolerances are guaranteed to be 0 to + 0.03 mm. Mold positioning The mold of the mold needs to be rotated 180° after one injection to perform the second injection. Therefore, it is necessary to check whether the two poles of the two poles close to the injection molding machine will interfere with the four pillars on the injection molding machine. The gap between the two should be at least 10 mm. If it is less than 10 mm, the two corners of the mold near the guide post should be considered to be cut off. Pay attention to the position and size of the positioning column of the rotating plate of the movable mold. It is necessary to select different injection molding machines according to the size and stroke of the mold and the height of the mold. Then, according to the parameters of the injection molding machine, the position and size of the positioning column, and the gate, Positioning ring radius. It is best designed to allow a set of molds to be used on different types of injection molding machines, so that it can be flexibly scheduled in the event of tight production tasks. Cooling system The water distribution of the two fixed and two moving modes should be as full, balanced and symmetrical as possible. The inlet and outlet pipe joints of the mold water transport should be as far as possible on the heaven and earth side, because if the water pipe joint is designed on both sides of the operation and reverse operation of the mold, the installation of the water pipe joint on the inner side will be inconvenient. Reasonable water transport design is very helpful for injection molding operations.Several common two-color film mold structures. Seesaw structure The slab structure is the rotation of the two sides around the center, with one side moving up and the other side going down, and so on. The seesaw structure is mainly used in keyboard mold designs with numbers and letters. Contains closed numbers or letters, such as 0, 4, 6, 8, A, B, D, O, etc. Only the use of a seesaw structure allows the secondary material to flow smoothly into the enclosed area, resulting in a beautiful appearance. The working principle of the seesaw structure is: after one injection, the mold is opened, and the broken needle is descended under the action of the push rod, so that the seesaw rotates around the rotating shaft, and the top plate is pushed up by the pushing of the seesaw, so that the broken The needle moves upwards, and a broken hole is broken at the boundary of the closed area of ? ?the primary product. Then, when the double injection molding is performed, the needle is moved downward by the action of the returning pin of the broken plate, and a circular hole is made, so that the secondary material can be drilled into the closed area from the broken hole. Medium plate structure In general, the two moving parts of the two-color mode are identical. However, if the structure of the product requires two different dynamic modes and does not require a side core pulling mechanism, then a medium plate die structure is required. The working principle of the middle plate mold is: during the injection molding process, the two movable molds do not rotate, after the injection molding machine completes one injection molding, the fixed mold opens, first the middle plate is ejected, then the middle plate is rotated by 180°, then The mold is clamped and then subjected to secondary forming injection molding. Thus, the inserts of the first and second portions of the middle plate can be made into different shapes to achieve the intended design purpose. "Twin" structure Two-color molds generally have two pairs of molds, which requires two mold holders. Sometimes two similar products are formed at one time (the symmetrical relationship or the matching upper and lower covers, the dimensions are similar). Two parts are used on one set of frames, and the "twin" structure is used. For “twin” molds, since the nozzle position is designed in two different positions in the same set of molds, this is determined by the position of the fixed plate barrel of the selected injection molding machine. The working principle of the "twin" structure: the mold is designed to have only one pair of mold bases. According to the position of the barrel of the injection molding machine, two glue points are determined, and the mold frame is divided into two parts, one part is formed once and a part is formed twice. 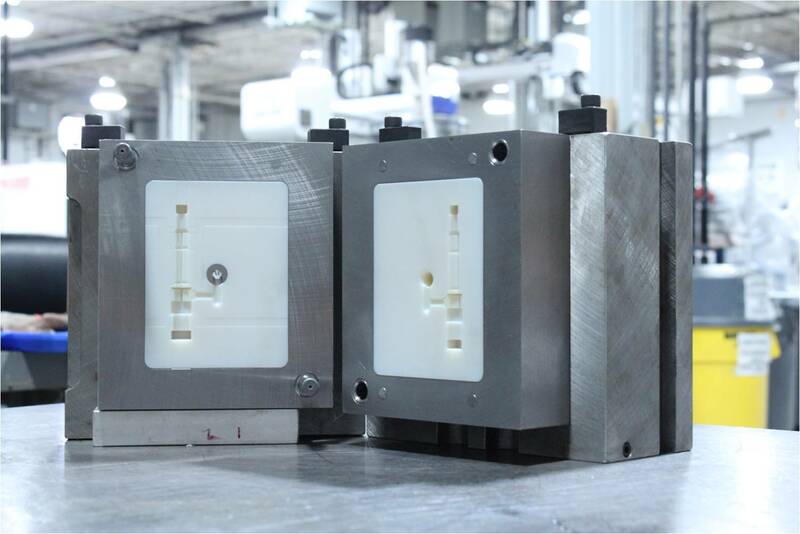 It is also the same two movable molds, two different fixed molds, such a mold is injected at the same time and twice, and only the part of the overmolded product is ejected when it is ejected. Produce a similar product each time.